While the IOS 8.0.2 update seemed to fix the plethora of problems presented in IOS 8.0.1, one problem I’ve been having on my iPhone has been the ability to copy and paste. After Googling this problem, I saw that many others were having the same problem on their i-devices. 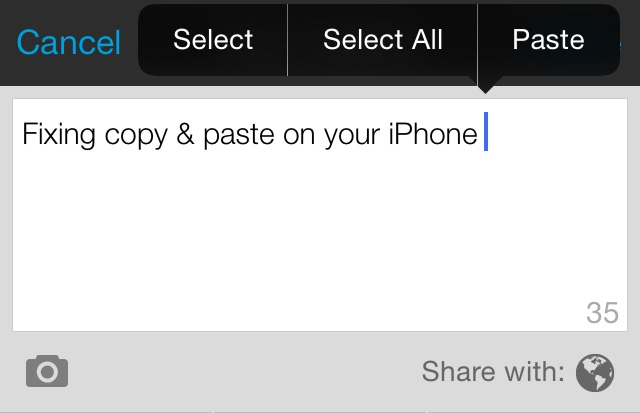 Specific Issue: I’ve been trying to copy & paste a quote from Facebook, Safari and Google apps into LinkedIn. I’ve been able to highlight and copy, however, when I go to paste, nothing will come up. After those 4 steps, I went into Safari, copied the quote and successfully pasted it into my LinkedIn app. Then I went back into Safari, copied another quote and pasted it into Twitter. The Paste bubble was a little slow to show, so when trying to paste, be patient for a few seconds to see if it will eventually show. You shouldn’t have to wait more than 3 seconds. Some forum posters tried to solve the problem by setting their device back to factory settings, however I did not find that to be necessary, but it’s possible that could be an additional step you could take to try to resolve the problem. If you try these steps, please let me know in the comments if you have success. Also, if you’ve done something else to fix this problem, please let me know in the comments.